Happy New Year everyone along with our sincerest hopes that 2019 brings you the joy, success, intensity and excitement in each and every fly fishing endeavor you’re about to pursue. January seems like a fine time to reflect on the achievements, adventures and tribulations of days on the water in 2018. We’ve said it before, but our measure of a worthwhile day with your trusty fly rod in hand is one in which something is learned or discovered. This ideally includes catching a fish or two, although sometimes; especially in the lean winter months, it may not. Resolve with the New Year to stumble upon some place new, fish for a new species, try a new technique, spend the day with a new friend or that elusive fishing acquaintance whose schedule never quite seems to gel with yours. Learning and growing, along with the fathomless opportunities that exist to do so are what constantly reinvigorate the sport of fly fishing and make it endlessly attractive. Besides a quiet look back on our previous year, January is also a great month to get out and find that first fish of the season. There’s opportunity out there and occasionally some nice weather to accompany it. Whether you’re looking for steelhead, bull trout, cutthroat, whitefish, or if you’re really lucky, a tailing bonefish on some tropical flat, that first fish of the New Year is special. I’ve always felt it’s an especially good omen when that fish happens to be a winter steelhead on a swung fly, but most years it’s not and something else will beat it to the punch. 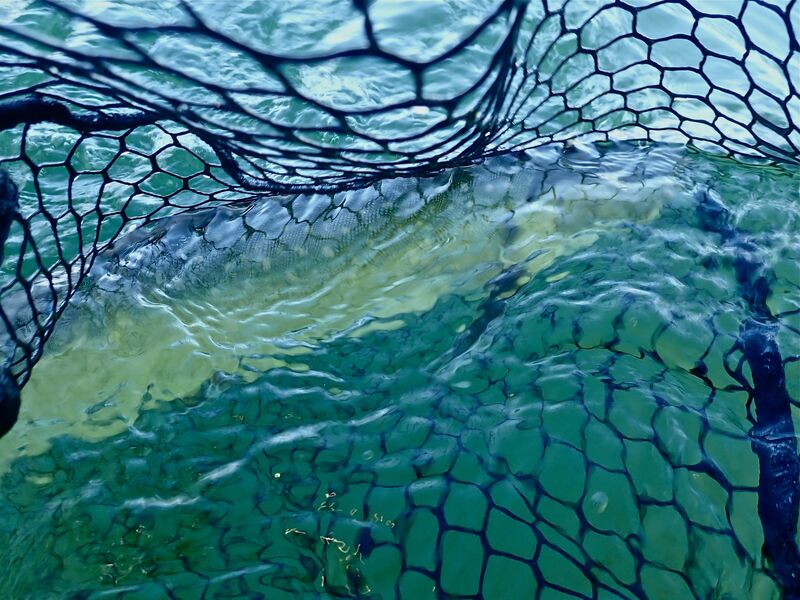 This year for me it was a 2 foot long salty bull trout that simply stopped the fly on its swing through a tidal rip. He fought tenaciously and put a nice bend in the 6 weight rod before we got the net under him. I spent the day with a great buddy on a decent tide, the Puget Sound like mirrored glass and a moderately warm sun beaming overhead. Hopefully I’ll fish enough and have the good fortune to swim enough fish that I may even forget a few over the next 12 months, but I’ll certainly remember this day as being the first of many. 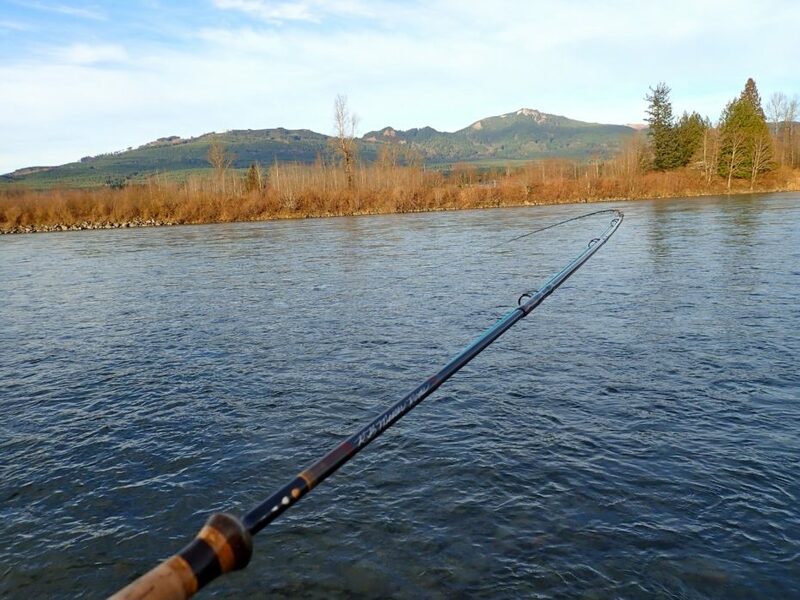 There’s plenty coming up to keep you occupied for a time, from the Fly Fishing Show in Lynwood, to an upcoming local fly tying night at Chuckanut North, the Writers on the Fly Cascadia Tour at Kulshan Brewing, movie nights and perhaps some cherished time on the water. Here’s wishing you the best in the new year, a hearty thank you for your role in making the last a great one at the shop and may your fishing days be what you want them to be. The clock is ticking on our North Sound rivers with many of them closing at the end of the month. The paperwork is in for a spring catch and release season on portions of the Skagit and Sauk and the preseason forecast is for enough wild winter steelhead returning to support a season. That said, we’ve yet learn any of the details around what the season will look like, so stay tuned as we hope to hear more in the coming weeks. It’s been a mixed bag of hatchery steelhead, some bull trout and a smattering of early wild winter steelhead from the Nooksack, Skagit, Sauk and Vedder River in BC. 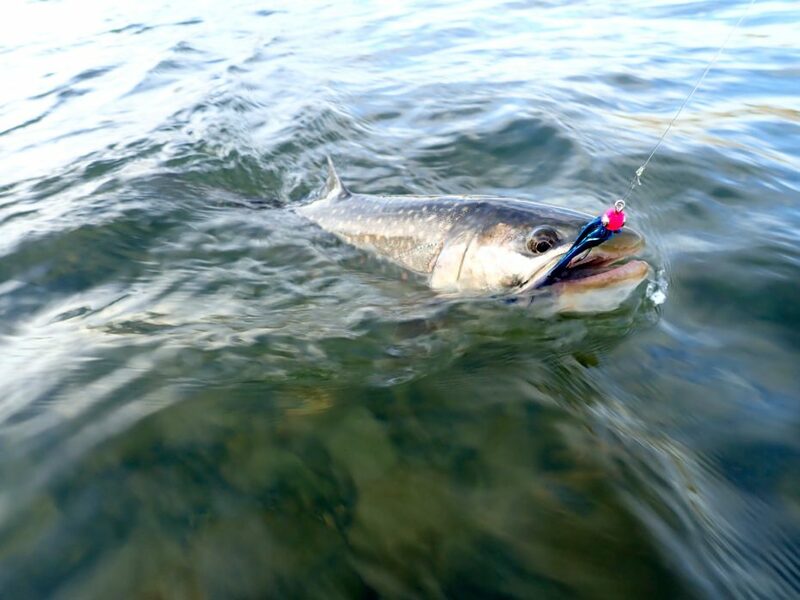 We’d be lying if we told you the fishing is red hot right now, but if you put in the time, you’ll find a few fish. Rivers are fishable right now, so take advantage of the conditions and plan a day on the water before Mother Nature shakes another angry fist and blasts of with more rain and 60 mile an hour winds. The Olympic Peninsula rivers are fishing decent with more wild fish showing up and the hatchery runs beginning to wane. Late January and February are excellent times to find some of the bigger bucks out there as they often enter the rivers earlier and take up station in the prime water to mark their territory. Finding these big boys is often a function of finding good, grapefruit to basket ball sized rock. Stay away from sandy-bottomed runs or bottoms of predominantly pea gravel and smaller cobble. Big rock attracts big fish and with some luck, they stick around and hold in these areas long enough for you to find them. Bring your big swimmy Intruders, Squidro’s and String Leeches and cover lots of water. The folks we know who consistently catch steelhead don’t break for lunch, fish long and hard and at the end of each day, have fished an extra run or two beyond your average person. There’s only so much to presentation and fly selection in steelheading, you need to cover a lot of water and cover it well to consistently make it happen. Bulls are pretty happy with your standard steelhead marabous, are particularly fond of Exasperator Sculpins, Black/Blue Reverse Marabous and Hoh Bo’s and have a penchant for anything white as well. For bulls, really concentrate on the slow streamy inside corners and tailouts of runs this time of year. If the wind’s down, some of our local year round lakes have been fishing decent, especially with the relatively warm temperatures we’ve been experiencing. There’s not a lot hatching out there right now, but people are catching trout on Squalicum and Pass Lakes fishing leech patterns, small minnow imitations and chironomid larvae (bloodworm) patterns like San Juan worms in red or pink. 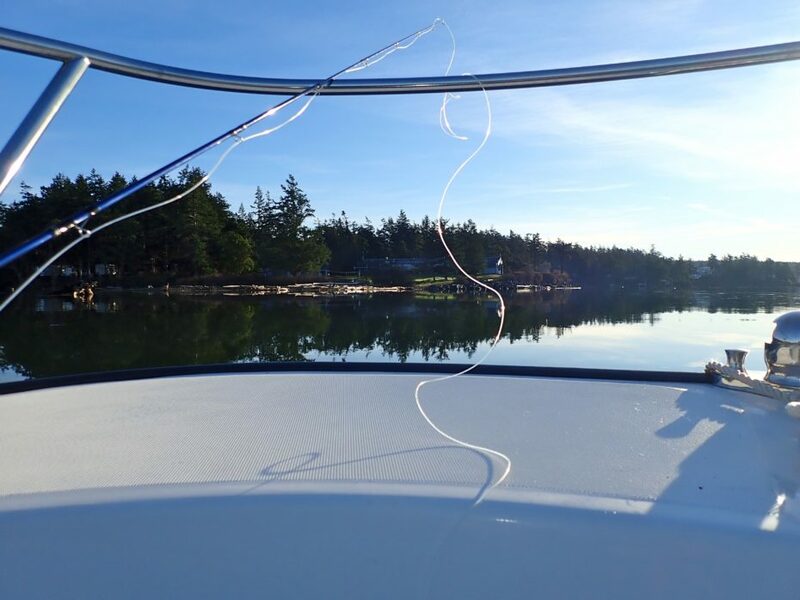 Winter is one of our favorite times to explore Hood Canal beaches for sea run cutthroat. Baitfish tend to be small and euphasids and small shrimp imitations become pretty important until we start seeing chum fry appear toward the latter part of February. Simple, non-descript flies like Olive Woolly Buggers and White Conehead Squids produce really well this time of year too. 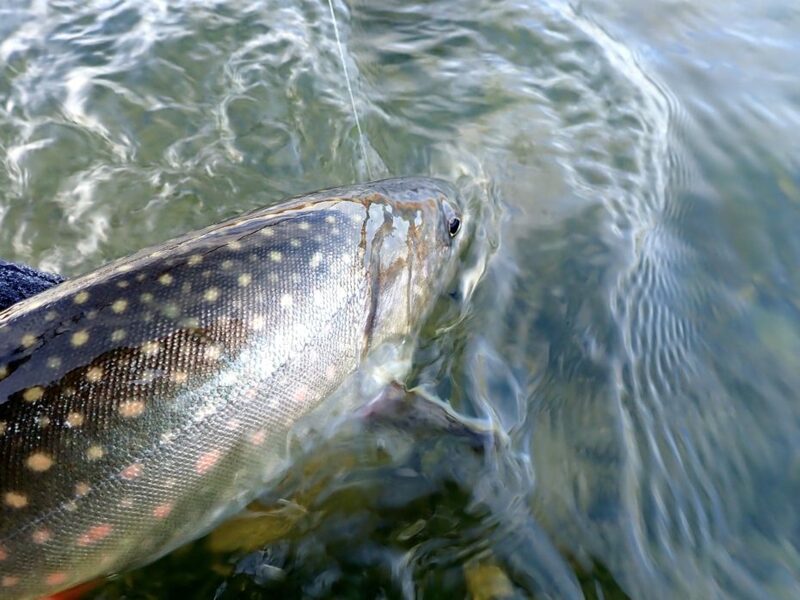 In the North Sound, we’re finding a few sea run bull trout around Skagit Bay and as we approach smelt spawn time, your bigger White Deceivers and Clouser Minnows are the ticket.